Jordan Shipley put City ahead with a shot from inside the box that deflected off U's defender John Mousinho. Conor Chaplin then doubled the lead from the penalty spot with eight minutes to go after Shipley was brought down by U's keeper Jonathan Mitchell. Jonathan Obika made it 2-1 late on when he headed in Luke Garbutt's corner. Oxford boss Karl Robinson was forced to watch from the stands, as he served the second of a two-game touchline ban. 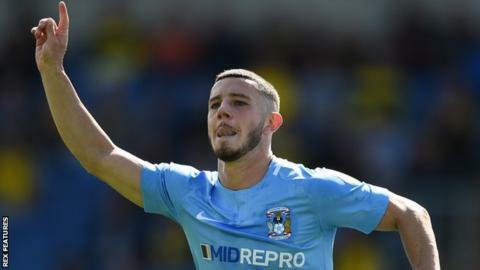 Coventry are now 12th in League One, four points off the top six, while the U's are second bottom having only won once this season. "Some of my players were not emotionally ready for this game. Emotionally, when things go against us, we're not very good. "I was tearing my hair out because I was seeing players doing things we've never worked on. There are lots of little things we can do better. "We always feel we can score but we've lost our momentum. And the league form is not acceptable." "It was a really tight contest and I thought we just edged it. "It's taken a hell of a lot of work to get ourselves two goals up. And we then conceded a rubbish goal from a set piece. "But we held out under a bit of pressure at the end, without really looking in too much danger. We had to work really hard to get this second league win." Match ends, Oxford United 1, Coventry City 2. Second Half ends, Oxford United 1, Coventry City 2. Corner, Oxford United. Conceded by Jordan Willis. Cameron Norman (Oxford United) wins a free kick in the defensive half. Jonson Clarke-Harris (Coventry City) is shown the yellow card. Goal! Oxford United 1, Coventry City 2. Jonathan Obika (Oxford United) header from the centre of the box to the bottom right corner. Assisted by Luke Garbutt following a corner. Corner, Oxford United. Conceded by Junior Brown. Substitution, Coventry City. Abu Ogogo replaces Conor Chaplin. Substitution, Coventry City. Tony Andreu replaces Jordan Shipley. Substitution, Oxford United. Sam Smith replaces Jamie Mackie. Substitution, Oxford United. Luke Garbutt replaces Shandon Baptiste. Goal! Oxford United 0, Coventry City 2. Conor Chaplin (Coventry City) converts the penalty with a left footed shot to the centre of the goal. Penalty Coventry City. Jordan Shipley draws a foul in the penalty area. Penalty conceded by Jonathan Mitchell (Oxford United) after a foul in the penalty area. Attempt blocked. Luke Thomas (Coventry City) left footed shot from the right side of the box is blocked. Jonson Clarke-Harris (Coventry City) wins a free kick on the left wing. Cameron Norman (Oxford United) wins a free kick on the left wing. Foul by Cameron Norman (Oxford United). Substitution, Oxford United. Jonathan Obika replaces Marcus Browne. Attempt missed. Jamie Mackie (Oxford United) right footed shot from the centre of the box misses to the left. Hand ball by Junior Brown (Coventry City). Cameron Norman (Oxford United) wins a free kick on the right wing. Attempt saved. James Henry (Oxford United) right footed shot from the right side of the box is saved in the bottom left corner. Own Goal by John Mousinho, Oxford United. Oxford United 0, Coventry City 1. Attempt blocked. Jordan Shipley (Coventry City) right footed shot from outside the box is blocked. Foul by Shandon Baptiste (Oxford United). Shandon Baptiste (Oxford United) wins a free kick on the left wing. Foul by Ricky Holmes (Oxford United). Junior Brown (Coventry City) wins a free kick in the defensive half. Jonathan Obika (Oxford United) wins a free kick on the right wing.